Vancouver, Canada thrashers Unleash the Archers are returning to North America. The band will be out on the road supporting their latest effort entitled Apex, that was released in summer of 2017 via Napalm Records. They have enlisted fellow Canadian rockers Striker to provide direct support and Helion Prime will open the shows. The tour kicks off September 9 in Seattle, Washington and runs through October 14 in Vancouver, BC. More dates are expected to be added soon, and a complete list of confirmed dates can be found below. "We are so excited to finally tour in support of Apex through North America! We have tons of fans here that have supported us from the beginning, and some that have only recently discovered us, and we can't wait to play for them all. We have been so humbled and amazed by how well this record has been received by our fans, and now we finally get to share it with them live; it's really just the greatest feeling in the world. 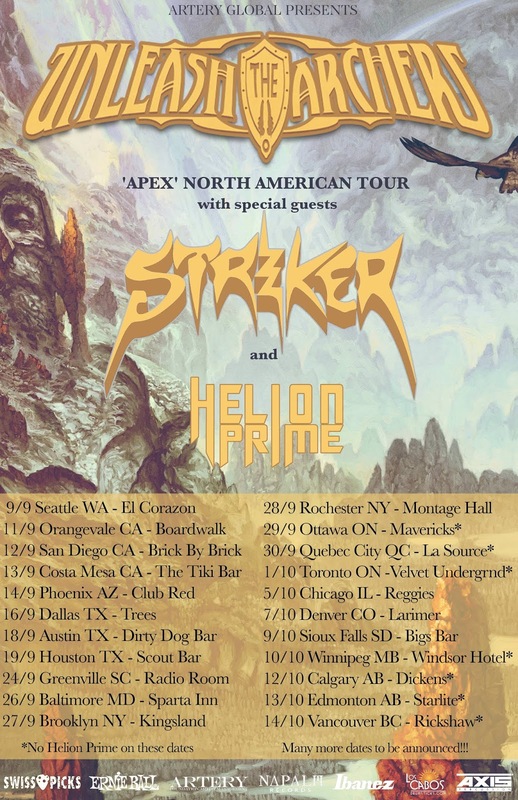 To top it off we're hitting the road with two bands that are very close friends, Striker and Helion Prime, so it's going to be a wild one for sure."